Poseable tail measures 12-inches long! Features over 25 points of articulation. 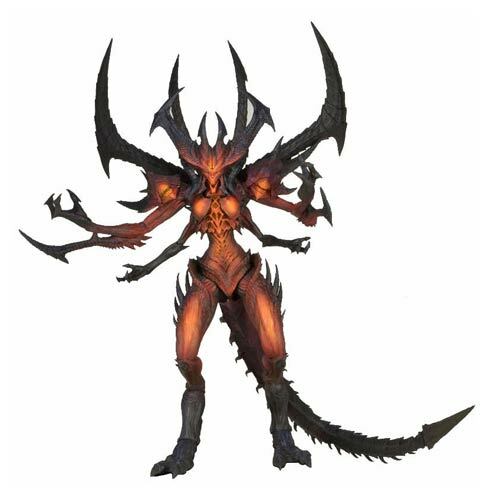 An evil steeped in the smoldering fires of Hell has been brought to life with terrifying precision here with the Diablo III Lord of Terror Deluxe Scale 9-Inch Action Figure! The Lord of Terror stands a little over 9-inches tall with a poseable tail that measures 12-inches long. Each figure is hand-painted and features over 25 points of articulation for poses to inspire panic and despair in other action figures! The creative collaboration between Blizzard’s senior sculptor Brian Fay and NECA’s Alex Heinke honors the 2014 Reaper of Souls expansion to the Diablo III video game.